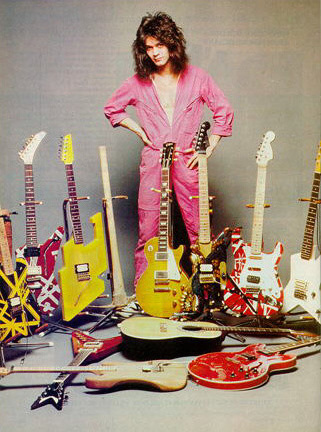 Eddie Van Halen Sues Nike! 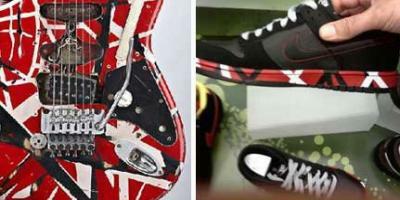 Nike best “Jump” cause the famed 80”s rocker, Eddie Van Halen is suing the corpo shoe giant for stealing his guitar design. Apparently a certain style of the Nike Dunk Low’s sports a red, white and black pattern that Van Halen claims is his trademark design. Which when looking at the pics, he’s got a pretty good case. They are very similar. Naughty, Naughty for Nike. Eddie’s company ELVH Inc, filed a lawsuit last week citing copyright infringement, in which they not only want some cold hard cash, but total destruction of all the kicks! Dayum son! This entry was posted in Skateboarding and tagged eddie van halen, funny, nike, nike dunk low, nike sb, Skateboarding, van halen on June 17, 2009 by Sandra Burciaga Olinger.